Dave Morgan playing with one of his favourite's, the Dwarf Sawfish in the Fitzroy River. A Team Sawfish acoustic tag on the dorsal fin of a juvenile Freshwater Sawfish in the Fitzroy River. Photo D. Morgan. Steve Beatty with an 'orangefish' in Wilyabrup Brook. 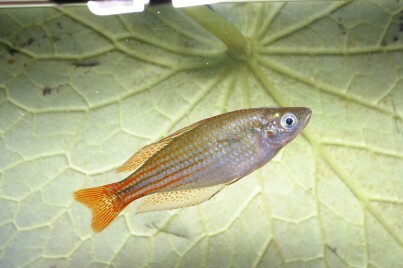 Our Team and the Cape to Cape Catchments Group removed over 3000 goldfish from the site in 2011. 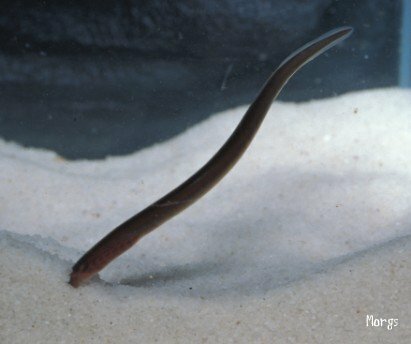 An ammocoete (otherwise known as a larval Pouched Lamprey). This living dinosaur belongs to a primitive group of jawless fishes known as Agnatha. A metamorphosed ammoceote (or downstream migrant) of the Pouched Lamprey. 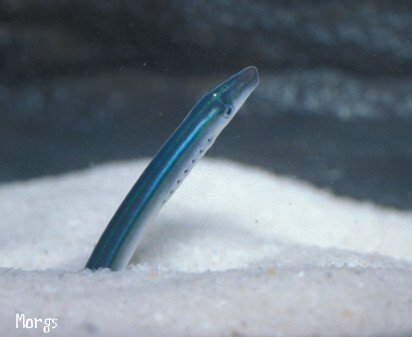 At ~10cm in length, this little fellow will leave our rivers and embark on oin oceanic journey that may see him (or her) parasitising fish in the Southern Ocean all the way to Antarctica, before returning to our rivers as an adult (see below). Classic riffle zone in the Blackwood River. Groundwater during baseflow is important for allowing fish passage through these zones. Steve working hard in a supervisory role whilst Fiona McAleer and Dave play around with a seine net in the Goodga River next to W.A. 's only vertical-slot fishway. Near pristine habitat in the lower section of the Donnelly River. See our publications and posters for info on the fish in this and other W.A. rivers. Photo D. Morgan. Pygmy perch and glass shrimp captured from the lower Warren River. See our publications and posters for info on the fish in this and other W.A. rivers. Mike Klunzinger and Steve Beatty during the Pearl Cichlid study and control program in Bennett Brook. Photo D. Morgan. In 2004 we held a competition with Mangkaja Arts in Fitzroy Crossing to design a logo for Team Sawfish. There were many great entrants but the judges chose Joy Nuggett's painting above of Freshwater Sawfish in the Fitzroy River. For more information go to the Team Sawfish home page. 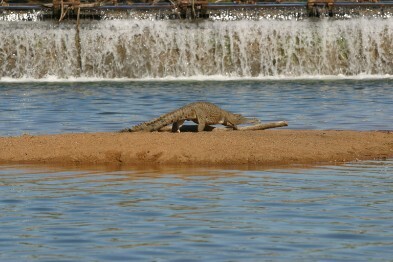 A not so friendly Fitzroy River local. Photo: T. Fazeldean. Nyikina-Mangala Ranger Travis Fazeldean recovering one of our acoustic receivers in the Fitzroy River estuary. The receiver records the presence of tagged Freshwater Sawfish as they move throughout the mighty Fitzroy. Go to Team Sawfish for more information. Team Sawfish measure a Freshwater Whipray in the Fitzroy in June 2011 - the Team also caught 52 Freshwater Sawfish in the pool! This must be a world record. Yiriam Ranger Cani Watson with a tagged Freshwater Sawfish that was trapped below the Camballin Barrage. The Barrage is believed to impact the migration of sawfish and other species such as Barra. 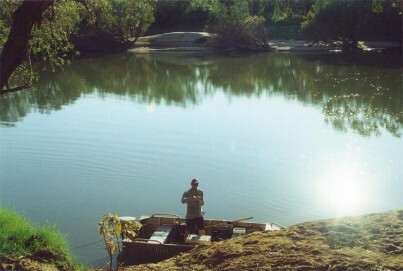 Cani Watson showing a young Charlie Morgan a Freshwater Crocodile in the Fitzroy River . Pearl Cichlids removed from the Swan River catchment. The Gingin carp - we got him! 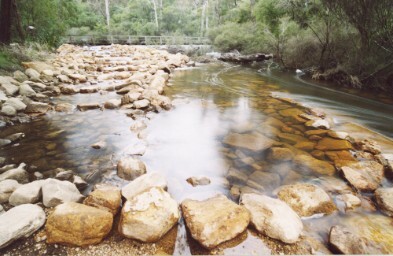 A spring on the Angove River, south-western Australia. One of the only known habitats for our Critically Endangered Trout Minnow. A young and innocent Stephen Beatty releasing Marron into Waroona Dam as part of a restocking program in 2004. Morgs and Beats check a Blackwood fyke net as part of the study of the migration of fishes in relation to groundwater dependency. We have conducted a considerable amount of research into Marron (Cherax cainii) biology. This south-west Australian icon supports an important recreational fishery in the region. Photo: D. Morgan. 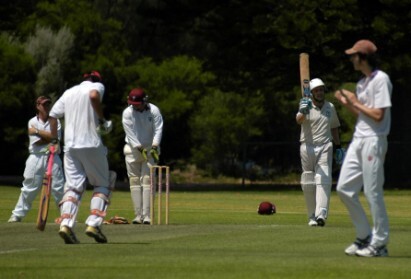 Beats makes another ton for the Pirates. Relevance to fish?......spot the Swan River in the background. 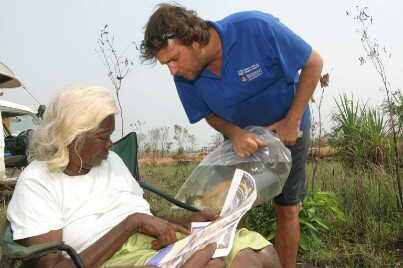 Brendan Ebner (pictured above with Australian Geographic volunteer Betty) and David Morgan recently joined the Australian Geographic expedition to Emma Gorge and the Pentecost River in the Kimberley region of Western Australia. The project, which was led by Dr Sean Doody, is investigating the fauna of the region prior to the invasion by the dreaded Cane Toad. Pictured below are a few other photos from the trip, including Ebb planking! I think Morgs has a new favourite river! Martin de Graaf (Department of Fisheries) and Steve Beatty about to undertake a chilly dive to survey the Smooth Marron population in Waroona Dam in September 2005. This was part of the Marron Recreational Fishery FRDC project. Photo V.Nguyen. A cross-sectional photo of the oocytes of a female Smooth Marron (Cherax cainii) taken as part of the study into the reproductive biology of a wild population. Photo S. Beatty. One of the more common and adaptable freshwater crayfishes of sout-western Australia, the Koonac (Cherax preissii). Photo S. Beatty. An algal bloom in the Vasse River from the air. The famous Busselton Jetty is in the background. The New River Wetland enters the river from the left and it and the river itself are infested with a population of Goldifsh (ideal conditions for the species and they reach ~18 cm TL in their first year, see our publications and posters). The species is known to exacerbate algal blooms and a control program funded by GeoCatch and the Shire of Busselton has removed hundreds of kilograms of the fish from just a few kilometres of river since 2003. Photo S. Beatty. Better out than in.....(top) Dave with a 1.3kg fish and (bottom) a 15 kg haul of feral Goldfish. Photos S. Beatty and D. Morgan. Another feral Goldfish control program by our group in billabongs on private property in the Warren River that removed nearly 100 kg of Goldfish. (top) Mark Allen enjoying a fire and full moon, and (bottom) the 6 inch pump used in the draindown. Photos S. Beatty. Team Sawfish, Fitzroy River, Kimberley, in June 2011. What a crack unit. Over 60 sawfish captures in a matter of days. It's scary how good we are! Nyikina-Mangala Ranger Travis Fazeldean with one of the many juvenile Freshwater Sawfish tagged in June 2011. Mark Allen rigging up on the Fitzroy in 2001 - the first survey of the fishes of this ecologically and culturally important river. See publication and subsequent fish posters. Dolores Cheinmora and David Morgan with some fish near Kalumburu, as part of the project of the King Edward and Carson River fishes and their language names. See the resultant fish poster with the Belaa names. Photo: S. Visser. Travis Fazeldean and Steve Beatty electrofishing the Donnelly River for fish and crayfish as part of a collaborative project with Fisheries WA and funded by the Water Corporation. Apex Weir Margaret River Fishway. This rock-ramp fishway was one of three fishways constructed in 2003 in WA. Photo: S. Visser.